Here is a short excerpt from my travelogue Notes of a Naive Traveler, about one of the many impressive holy sites in Nepal I was lucky enough to visit. Last weekend, our neighbor’s son Shekhar and various family members took me to Budhanilkantha and Sundarijal, two holy sites close to our house. To get to Budhanilkantha, Shekhar led us up the very high hill behind our house, through a collection of tiny villages bordering the river flowing past the rice paddies visible from our rooftop terrace. It was the first time I’d gotten to see how much of a rural setting we are in – there’s nothing behind our school except for impossibly tiny homes, rice, wheat, and potato fields. We walked along small built-up trails rising between the patches of dirt, used by farmers to navigate through their fields without crushing the crops. Along the riverbanks, tiny bamboo groves had sprung up, and the sound of the wind rushing through them – accompanied by the stream – was magnificent. Budhanilkantha (literally “old blue neck”) was a remarkable site. Around an enormous sleeping Vishnu statue lies an interesting array of stone shrines honoring Ganesh, Shiva, and other gods I didn’t recognize. 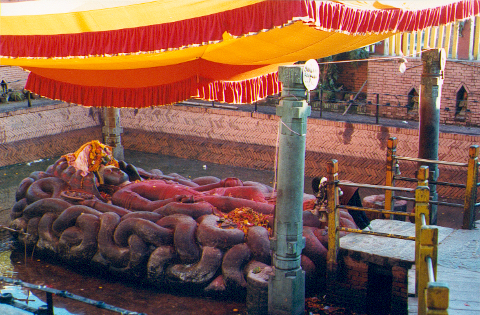 The Vishnu statue is covered by an elaborate red tent trimmed with red and gold fringe – nice and festive. A moat surrounds the stone carving, which is decorated with fresh garlands of flowers and tika powder. As I’m not Hindu, I wasn’t allowed to go inside the actual compound, but luckily there was only a railing around the statue with poles far enough apart to be able to see into the complex. I watched various worshippers leave offerings of food, flowers, and tikas. Notes of a Naive Traveler: Nepal and Thailand is available as paperback and eBook on Amazon, Barnes & Noble NOOK, iBooks, Kobo, Smashwords or your favorite online retailer. This is such a wonderful book. I loved every page of the journey! My compliments! Pamela wrote: "This is such a wonderful book. I loved every page of the journey! My compliments!" Thank you, Pamela!! I really appreciate your support.